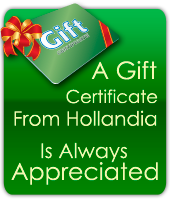 You have just purchased a top-quality plant from Hollandia. Given the proper installation and care, this plant will provide you with many years of enjoyment. Be sure to call one of Hollandia’s professional horticulturists if you have any questions or need advice regarding your new plant. Always start with the soil! The best time to improve your soil quality is before you plant. Always mix organic matter such as peat moss or compost at a rate of 1 part organic matter, 3 parts existing native soil. Do not add peat moss with PJM Rhododendrons. Extra attention to watering during the first year will greatly increase the longevity, quality and health of your investment. Watering by hand using a fine soaking nozzle attachment on a hose. Water the root area of the plant; do not water the foliage. The best time of day to water is early in the morning. If this is not possible, water early in the evening. Thoroughly water your new trees and shrubs every 5 to 7 days. Add organic matter (peat moss, humus, etc.) to the existing soil to increase water absorption and retention. Use organic (Pine Bark, etc.) at the base of your plants in a 2-3 inch thick layer. Remember not to apply mulch too thickly. Before winter (November), apply Wilt Pruf to the leaves of your evergreens. Prevents dehydration and acts as a sunblock. Dig a hole 1 ½ to 2 times as wide and same depth as the root ball. To install a container grown plant, first turn the plant on its side, tap the bottom and then gently pull the container off. 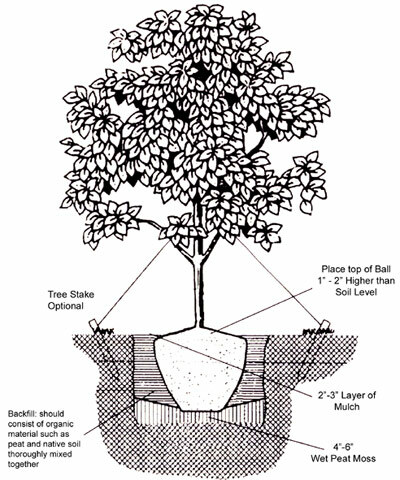 Place the plant in the hole so that the top of the root ball is 1” –2” higher than the soil around it. Stabilize or secure the plant in the hole by backfilling with your amended soil halfway up the side of the root ball, gently tamping the soil down as you go. If your plant is wrapped in burlap or wire cage, after the root ball has been stabilized, cut string/cord carefully from the top, being sure not to damage the trunk or stem. Then peel back the burlap from the top of the plant and bend back any sections of the wire cage that might show up after planting is completed. At this time add 2 to 3 handfuls of Plant-Tone around the branch line of the tree. At this point a root stimulator may be added to the soil if so desired. Here at Hollandia we suggest Roots. Follow product directions. Fully backfill around rootball and create a crown as shown on front illustration prevention. Apply a 2-3 inch deep layer of mulch to aid in water retention as well as weed prevention. Make sure all new plantings receive adequate water. See “Watering Tips” for specific advice. Plant-Tone is a great choice for all trees, shrubs, flowers, vegetables and plants, here in New England. Holly-Tone works best on acid loving plants such as Azaleas and Rhododendrons. Be sure to consult a Hollandia sales personnel regarding the ideal fertilizer for your plant. File your Hollandia receipts in your “Home Improvements” file because landscape additions increase the value of your home similar to other home remodeling projects. Also, if your plant fails to adapt to its new location, you can easily find the receipt you need to get a credit from Hollandia. If you experience problems during planting or after, please call us as soon as possible for advice or assistance.